Modern record players are a great way to play your favorite vinyls from the good ol' days with a new and improved music system. 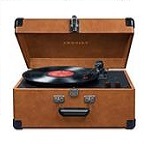 Our Crosley record players are the perfect fit for any record lover, or try our portable record players for music on-the-go. Horn record players combine the great old look of antique brass and modern components to achieve a very unique vintage phonograph design. Looking for something you don't see here? 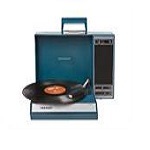 We've got a variety of record player categories like AM/FM radio record players, bluetooth turntables, iPhone phonographs, and USB record players. 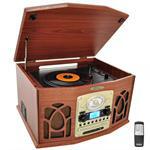 Be sure to check them all out to find that reproduction antique record player you've been hunting for! 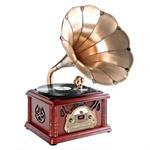 Want to read more about record players? Check out our vintage record players resource pages to find more information about owning and operating these timeless classics.